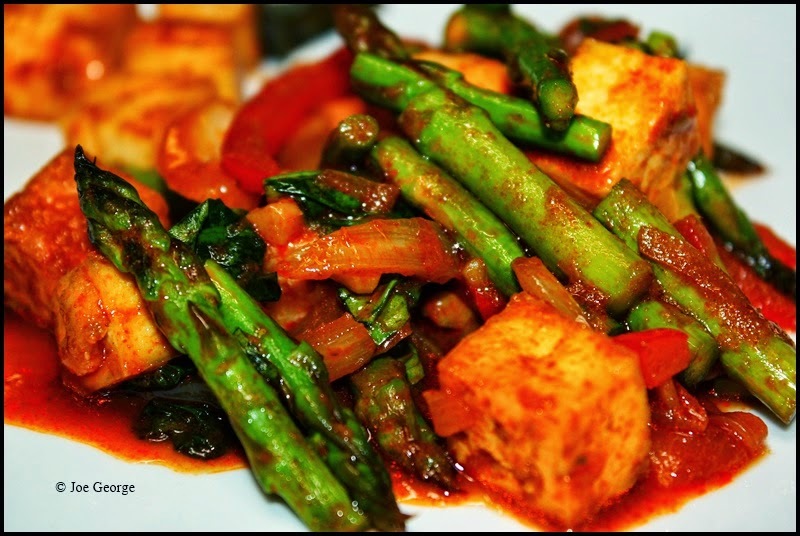 Urban Simplicity: Asparagus and Bean Curd with Thai Red Curry. Asparagus and Bean Curd with Thai Red Curry. This is another recipe that is about the method and not necessarily the ingredients. What I mean is that this is a really basic recipe where the ingredients can be changed to your liking while using the same seasoning (or similar seasonings) but using the same simple stir-fry method to prepare them. Anyhow, this is really easy to make and super delicious. Preheat an oven to 400F. Dice the tofu and spread it onto a lightly oiled baking sheet. Bake the tofu for about 30 minutes, turning it every ten minutes, or until lightly browned. Remove the tofu from the oven and set aside. Heat the 3 tablespoons vegetable oil in a heavy skillet over medium-high heat, then add the sliced onion and bell pepper; stir-fry for a couple minutes, then add the garlic and cook a couple minutes longer. Add the asparagus, cook for a minute or two, then add the red curry, mixing it with the vegetables. Add the cooked tofu to the pan, along with the vegetable broth and soy sauce. Bring to a boil, tossing all the ingredients together, then stir in the basil and remove from the heat.